I had a thought while writing my last blog post that brought me back to something my dad always told me when I was young. This thought then got me thinking more about my writing style and how it has evolved in this age of blogging where we are competing for peoples attention online. My thought was how can I remain engaging in my writing without sacrificing grammar? How can I flirt with that line of fun down-to-earth blogger while still sticking to those grammar lessons my dad taught me oh, so many years ago? To start with, what was this grammar lesson that has stuck for so many years? It was all about when to use and mostly when never to use the words very, so and super (which is my addition to the list). The rule goes simply if you need to use one of these words can you A. take it out and get the same effect or B. can you use a more appropriate word? 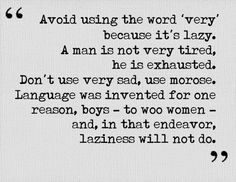 I recently watched the Dead Poets Society for the first time and felt Keating’s anecdote regarding these words was bang on. Blogging is a new thing for me and as I find my voice I catch myself bending the grammar rules that I so painstakingly was forced to learn! Sentences like “I am super excited to share this project with you because I think it is so cute and very practical.” Why do I find myself wanting to write like this when I know that grammatically it is a waste of space and it doesn’t even sound intelligent? I think writing a blog is much different than writing an essay or journal article because you are attempting to stay casual with the reader and write as if you were talking to them. As a blogger you need to find that line where you are being casual enough with the reader that they are enjoying themselves while still maintaining some semblance of respectable literary material. Does this sound better? “I am excited/ecstatic to share this project with you because I think it is cute/adorable and practical.” I think so. After inspiration from Dead Poets Society and never forgetting my dad’s words of grammatical wisdom, my new goal is to find my blogger voice that omits the above mentioned words while still making my readers feel like they are having fun. Let me know how I do!